This four-bladed vaneaxial fan is called a Jet Fan because a highvelocity jet of compressed air is ejected from the trailing edge of the blade, as shown in the diagram. This results in the forward rotation of the fan wheel just like a jet plane is pushed forward by the high-velocity jet ejected from the rear of the jet engine. Suited for ventilation of tanks, process vessels, or other confined areas for the removal of hazardous fumes or contaminated air from welding, sandblasting and other operations. Design allows for lower RPMs while still moving more air. Use as blower as exhauster. Electro polished stainless steel fan guard. Heat treated to T6 aircraft aluminium specifications. Guide vanes to eliminating turbulence which smooths air flows and increases efficiency. Fan design by one of the foremost fan engineers in the world. 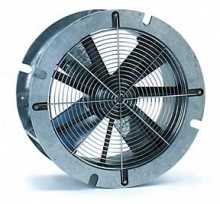 The unit consists of a rugged cast-aluminum housing and a cast-aluminum fan wheel. The hollow shaft and the fan wheel are the only rotating parts. However, there is no torque on the shaft, as it does not transmit any power to the fan wheel, as fan shafts normally do. The compressed air jets drive the fan wheel. The fan wheel has a hub and four blades, producing adequate static pressure to overcome the resistance of the system to be ventilated. Only two of the four blades have jet outlets. The two other blades have good airfoil cross sections for a better induction ratio. The housing is equipped with guide vanes for better efficiency. The vanes will neutralize the air spin past the blades and guide the air flow into an axial direction. The housing has a smooth inlet bell for increased CFM, higher efficiency, and lower noise level. Its performance was tested at an independent test lab to the AMCA Standard 210 test. All results are verified and specific.